In the age of digital copies and endless streaming options, there always seems to be something to watch. This leaves only a few reasons remaining for actual physical copies of films, and the latest release of the Jurassic Park collection hits them all. 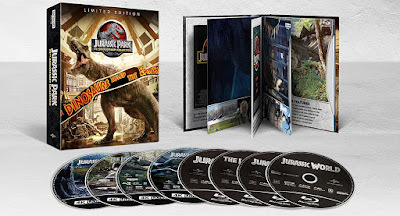 The first reason is the anniversary of a movie’s release, and this latest collection of the Jurassic Park franchise coincides with the 25th anniversary of the first groundbreaking film. The second reason for a re-release is to coincide with a new installment in the franchise. This simultaneously gives fans the opportunity to refresh their memories before Jurassic World: Fallen Kingdom is released this summer, while also serving as retail advertising. Finally, the last reason to choose a physical copy over streaming is quality, and the 4K Ultra HD release is the best option for that.